Being based in Orlando, Florida I am fortunate to be blessed with a wide range of colorful and interesting photography subjects. Lush vegetation, flowers, plenty of wild creatures (not to be confused with tourists), gorgeous sunrises/sunsets, and beaches. When I first started trying to build a body of photographic work I was inspired by the distant locales highlighted in some of my favorite magazines like Outdoor Photographer and National Geographic Traveler. I longed to shoot in those locales, and when I was able to travel I would try to schedule time to photograph and planned accordingly. While I did capture great images I was often disappointed that my photos didn’t always look like the iconic ones associated with my destinations. Then it struck me, who is more likely to get that top shot of an eye popping sunrise behind Diamond Head? Me, on perhaps my once in a lifetime visit to Oahu, or an avid photographer living in Honolulu who can catch sunrises any day? If you guessed me, I appreciate your faith in my abilities, but you would also be assuming that I am lucky enough to be there when that eye popping sunrise occurs. However, I’m not suggesting you skip a sunrise shot on your next trip. So what is my point in all this? Research the interesting and iconic subjects in your area. Think about where you live and why people might travel to it. Most towns have a Chamber of Commerce website, or a local interest section in the bookstore, or a simple Google search can identify great places to shoot. Do an image search on the same subject to see what other work has been done. Find images you like and try to replicate the craftsmanship, or put your own spin on the subject. One place I found on a web search when I first started exploring Central Florida is Gatorland in Kissimmee, FL. Gatorland is a 110 acre theme park/zoo which bills itself as the “Alligator Capital of the World.” The Breeding Marsh is part of the Florida Birding Trail, and during the spring is filled with marsh birds building nests, laying eggs, and caring for their hatchlings. Gatorland has been an absolute boon to my collection of work and my time there has greatly influenced the development of my artistic vision as a nature/wildlife photographer. But, what if wildlife photography is not your cup of tea? Or, your passion lies in some different subject? Find that subject and do a Google search for it plus your area. There may be a local club that meets regularly or an annual festival/event that you can photograph. You assignment is to find your own ‘Gatorland’ near you and start shooting. Perhaps the experience will further shape your own artistic vision. 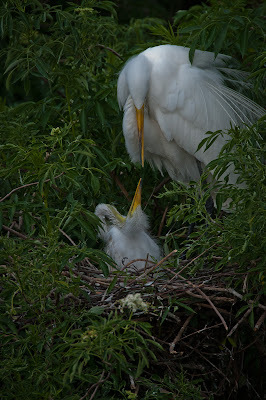 Check out more of my images from Gatorland at www.BradScruggsPhotography.com.